The most western point of France is Pointe du Raz. This, now protected, headland was used by the Germans to install a vast radarsite. Two Freya and three Würzburg Riese radars were protected by a Fla Zug with 3 x 2cm Flak. A controlling HQ type L 479 was built together with some personnel bunkers type 622. The exact list of Regelbauten is hard to give, as most of the bunkers are covered. North of the village of Lescoff more inland lies a Mammut Stellung with a L 485 (old version). Finally at the Baie des Trépassés a small infantery defence line protects the beach. The L 479 was used as dump during the oil disaster some years ago and it's advisable not to enter it. Pointe du Raz was designated Qu 13 and Qu 500. 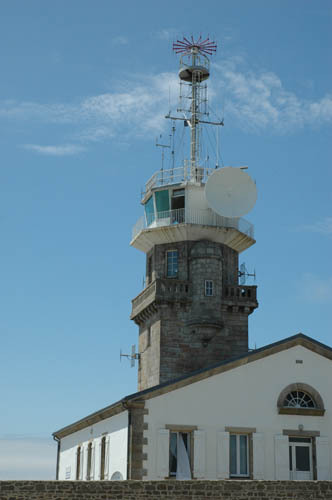 The old Semaphore of Pointe du Raz.